Swami Sadananda, as he is popularly known, was the first western adherent to Gaudiya Vaishnava philosophy in the 20th century. Sadananda was of German descent. He traveled to India, became an initiated disciple of Bhaktisiddhanta Saraswati and was later interned in a prisoner of war camp in India during World War II. Upon his release at the end of the war, Sadananda traveled extensively in India and eventually returned to Europe where he established a modest following in Sweden, Switzerland and Germany. That following of disciples continues to this day. Q) How did Swami Sadananda come in contact with the teachings of Gaudiya Vaishnavism? 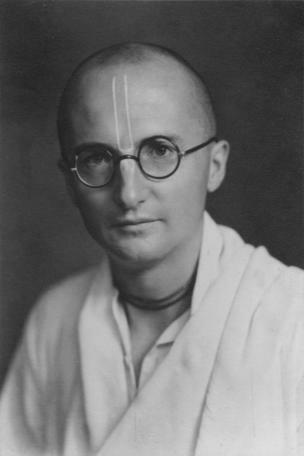 Sadananda then worked for the mission both in England and Germany until Bhaktisiddhanta Saraswati invited him to join his mission in India, where Sadananda arrived in September 1935, together with Swami Bon and Baron Von Koeth from Germany. 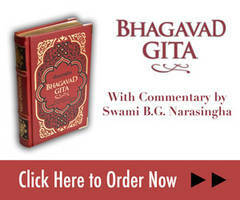 Q) Did Swami Sadananda ever speak about his years in the Gaudiya Matha in India? What places, what events, and what personalities and Godbrothers did he mention? He could only serve his gurudeva in the Gaudiya Matha from September 1935 till January 1937. From his notes it seems that he followed Bhaktisiddhanta on his tours, took notes from his lectures etc. Most of the time he was certainly engaged in studying the shastrams, preparing lectures himself and writing articles for The Harmonist. Not much is known about his relation to his Godbrothers during this time but we know that he never felt at home in the Gaudiya Matha. Q) Did Swami Sadananda often speak about his guru, Srila Saraswati Thakura? What sort of things did he say? Q) Who was Vamandas and what is his connection to Swami Sadananda? The Austrian Walther Eidlitz (Vamandas, 1892–1976) was a successful writer even as a youth. Some time before the outbreak of the Second World War, he felt an irresistible yearning for going to India to study its ancient religion, and went there with the intention to bring his family along later. The war interfered with these plans, however, and, as the family was Jewish, Vamandas’ wife and son were forced to flee from the Nazis, and, eventually, found refuge in Sweden. Meanwhile Vamandas, as an Austrian citizen in India, was interned in an Indian camp, where he met his guru, Swami Sadananda Dasa, who in that place began his uninterrupted teaching of him. (See Eidlitz’ book Unknown India) After his release from the internment camp and before he left India for travelling to Sweden, Swami Sadananda and Bhakti Hridaya Bon Maharaja came to Bombay to see him. Swami Bon wished to initiate him into the Gaudiya Vaishnava tradition and from him Vamandas received his spiritual name Vimala Krishna Vidyavinode Dasa. From his first guru, Sri, he had already got his name Vamandas, and for some reason Sadananda continued to call him so even after his initiation. A few days later, in July 1946, Vamandas returned to Europe and Sweden and worked there continuously to spread the knowledge of the shastrams, the revelation of God’s word-form, through lectures, courses and books. All this time, Sadananda assisted him with untiring devotion by providing him with material and correcting his misconceptions. Some books (especially the German book Die Indische Gottesliebe, in Swedish Krishnas Leende) unfortunately contain many errors, because Vamandas was still mixing mysticism into the teachings of pure bhakti. The later books, however, and above all his work, Krishna Chaitanya, Sein Leben und Seine Lehre (Stockholm University 1968), give a brilliant survey of the essence of shastric revelation. In spite of the mistakes Vamandas had made in the beginning, Sadananda wrote in one of his last letters to him: “Tell your friends, that everything they do for you, they do for me as well.” We cannot be grateful enough to Vamandas. In addition to all the books he wrote, he also brought Sadananda to us, here in the West. By his lifetime achievement Vamandas broke new ground, presenting in a European language a knowledge that at that time was practically unknown in the West. Q) What did Swami Sadananda do after Bhaktisiddhanta’s disappearance? After the disappearance of his Gurudeva in January 1937, Sadananda went on a study tour and pilgrimage all over India, from Badarinatha, close to the Tibetan border, to Cape Comorin (Kanya Kumari, South India). On his pilgrimage, mostly on foot, he gave many lectures at universities, colleges and monasteries, visited holy places, discussed with scholars, lived in caves with solitary sages, collected manuscripts of the Chaitanya movement, was a guest at the homes of great maharajas and industrialists, but always lived as a mendicant, till he was arrested and put in an internment camp in September 1939 – due to his German citizenship. Q) Did Swami Sadananda ever speak about his years of prison internment in India during World War II? What events did he relate? “In the dark hours, when it appears to me, that the pangs of separation from those who love Krishna – for whose service I came to India – are unbearable, I have repeated visions of living in overcrowded quarters amidst the scorching blazing heat of a fire consuming the small buildings around me. My tongue is parched and I feel suffocated. So far I’ve had the strength to overcome the depressions, vanishing like thin transparent evening clouds before the waxing moon of my hopes. Now I visualise the hopeless nights with heavy layers of clouds, overcasting the sky without even the chance to catch one ray of the waning moon. I visualise the day when I will be asked as one in a flock of cattle to leave the country in which I was living in the loving service of my beloved Gurudeva earlier in my life. Because others, not myself, identify my real person with the perishable covering of flesh and bones, called a German individual. Perhaps it was not practical, considered from the point of view of sound common sense, to agree to the play of identifying myself sometimes with something I was not. Yet, this was the only chance to try to carry to others, occasionally at least, the outside cover of the exoteric mysteries of the art of love for Krishna. I apprehend the day when I will know for certain not to be fortunate to bow down to the samadhi of my beloved Master or to touch the lotus feet of the few great souls left on this earth from all entourage. Q) What did Swami Sadananda do after his years of prison internment? Not much is known about what happened to Sadananda during the following years. One has to keep in mind that it were turbulent times in India then: 1949 it was declared a republic, then it was divided into India and Pakistan, resulting in heavy religious conflicts and one million people dead. But after things had settled down a bit, in November 1950, Vamandas returned to India from Sweden – where he had found a place of refuge after his release from the internment camp in 1946 – and spent five months together with Sadananda in Mayapura, Puri, Mathura-Vrindavana and Benares. After this period Sadananda mostly stayed at a poor friend’s house in Howrah, Calcutta, most of the time bedridden. From now on, and for ten years, he tried to gather strength to go to his friends in Sweden, who regularly sent him money for his survival. During these years he worked constantly with his translations of the shastrams, sending new material to his friends in Sweden and especially to Vamandas, for his books, lectures and courses in Europe. But to his great disappointment, he gradually realized that Vamandas could not pass on the teachings he had received from him in its pure form. Still, he continued to help him, even sending him hundreds of pages of corrections to his second book, Indische Gottesliebe, published in German and Swedish in 1955. Q) When did Swami Sadananda return to Europe from India? In 1961. A small group of Swiss had realised Sadananda’s deteriorating state of health under the deplorable living conditions in Calcutta and offered him a flight to Basel. In Basel an oral surgery operation healed his fever that had lasted for many years and – in combination with other tropical diseases and several failed surgeries in the internment camp – had often brought him to the verge of death. In the following he lived in Basel and payed periodical visits to Sweden in the summers. Q) Did you ever meet Swami Sadananda personally? I only met him a few times before his disappearance in 1977 but these meetings changed my life thoroughly. His outer dress and behaviour didn’t reveal anything extraordinary – on the contrary. But my distinct feeling was that he was not of this world and that he could read every secret thought I had. On one occasion I spent a few days with him together with his disciple Vamandas (Walther Eidlitz) and I was appalled at seeing 80-year-old Vamandas turn into a 5-year-old boy in the presence of his much younger Gurudeva. Hard as a thunderbolt, and for two days, Sadananda criticized him severely for the many mistakes he had done in his translations of the shastrams etc. Q) What was Swami Sadananda’s demeanour/character and what did he stress as the most important message of Gaudiya Vaishnavism? Still, Sadananda could not stand distortions of the bhakti philosophy. This made him very upset. “Mr. A. is of the opinion that “Sweden is too small for Sadananda”. – Tell him that the world is too small for me. I might find two or three people in a whole continent, who can understand what rasa is and who are able to appreciate a work of rasika as the Bhagavatam or Chaitanya-charitamrita. Here in India there might be two or three persons? Bhakti is difficult, the individual is completely alone with God and it is very, very difficult for one – even if he had a guru – to actually practise bhakti in the West, i.e. to sense what is chit behind the veil of the seemingly Indian appearance and covering (externally and linguistically). 99,9 % of those who listen to you and read your books while they search will cool down after their fi rst enthusiasm and go on searching somewhere else. People want to bring themselves, the concrete man himself, into bhakti – man, whose worthlessness they are unable to realize, because they don’t know and experience anything else than what they daily and since millions of lives before have known and experienced as their ‘I’. Q) What do you consider the most important among the writings of Swami Sadananda? Q) In what countries did Swami Sadananda preach in Europe and during what years? What type of programs did he have? He wanted to stay in the background and let Vamandas meet the public. Vamandas wrote books, gave lectures in Sweden, Germany and Switzerland and had summer courses in Sweden. Sadananda himself mainly focussed on his translations and dictating them to his disciples and friends. Q) How many persons came to Swami Sadananda in Europe to become his disciples? Only a few who met Vamandas came to Sadananda. It is hard to say, but maybe he didn’t give initiation to more than a dozen during his lifetime, in India and Europe. But some others, who only met him briefly, now consider him to be their shiksha-guru, by listening to his vani in his texts, as well as others who never met him in person. Q) What was Swami Sadananda’s view of Christianity or Western religion in general? “We have no reason to doubt that actual and real Christ – not what is going on to be given as ‘Christ’ – is the way to God the Father. In relation to Him we are like children, but this father-children relation is only one of the possible forms of relation the soul can have to Him, and it implies the great danger to look at Him as the Divine Order Supplier or Department-Store Director to whom we may appeal for redress of our moral, intellectual, physical or spiritual wants and needs. Q) What did Swami Sadananda consider as his task in regard to his friends in the West? Thank you very much! Gaura Haribol!